I’m recently back from a whirlwind week long trip to Guangdong province in China. The capital city Guangzhou is the home of Cantonese food and I am obsessed by many spectacular dishes I enjoyed there. Some were complicated like stuffed mud carp and a candy like crisp pork belly, and some were rather simple yet very compelling such as the congee I ate every morning topped with fried peanuts and some preserved vegetables. 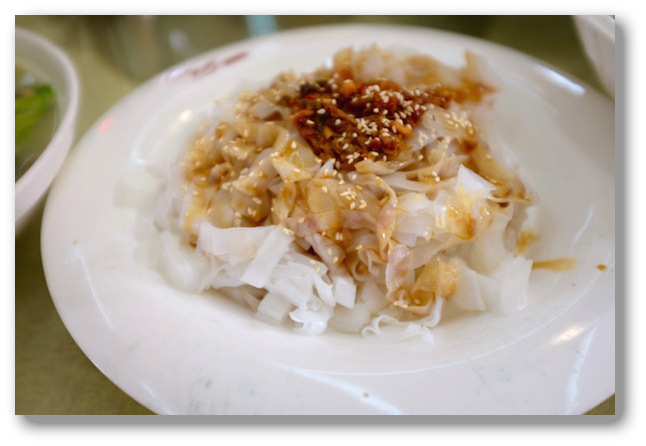 One of the simplest dishes I had was a pile of thin flat rice noodles tossed with vinegar, sesame seeds and a generous dollop of XO sauce. The savory, salty, fishy, hot and sweet ingredients in the sauce all meld together to make something greater than the sum of its parts. 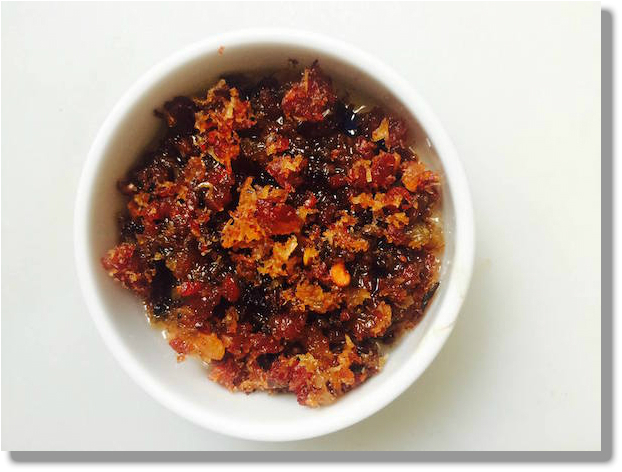 XO sauce was invented in Hong Kong, possibly Kowloon, in the 1980’s and there are many different recipes for it. The name XO means extra old, like you see on a very expensive bottle of cognac (popular in China). But there isn’t any cognac in XO sauce, although the dried seafood used in it is rather expensive. The sauce is primarily dried seafood and ham or sausage and pungent aromatics and while you can buy it, it’s extremely satisfying to make. Fortunately you can easily find all the ingredients for it easily in an Asian market. I found the dried shrimp and scallops in a refirgerated case with tofu and noodles. Use the absolute best quality you can find. This sauce is kind of crumbly and chewy. It’s super easy to make and just a pure umami bomb. Add it to fried rice, rice porridge, dumplings or noodles, steamed green vegetables or fish, or on anything you like! I’m thinking a jar of it would make a really nice gift this time of year but I wouldn’t blame you for keeping it all for yourself. My version of it is adapted from various sources primarily recipes by David Chang and Kylie Kwong. I first made David Chang's recipe but I felt it had too much ginger and garlic. My version is closer to what I had in China and unlike Chang's version mine includes shallots and Shaoxing wine. Place the scallops and shrimp in a medium bowl and cover with water allowing extra water since they will absorb most of it.. Cover the bowl and let sit overnight. Heat the oil in a large skillet, preferably nonstick or cast iron. In a food processor pulse the Chinese sausage until finely minced. Place the sausage crumbles in the oil and cook for 3 minutes. Meanwhile drain the scallops and shrimp, place them in the food processor and pulse until finely minced. Repeat the process with the shallots, garlic and ginger. Reduce the heat to very low and add the chile flakes and minced scallops, shrimp, shallots, garlic, ginger, Shaoxing wine and soy sauce to the pan. Stir the mixture and let the sauce cook over very low heat for 45 minutes, stirring occasionally. The sauce should dry out and turn a deep redish golden color and have a thick sludge-like consistency. Remove from heat, let cool slightly then store in a covered jar in the refrigerator.